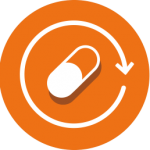 Neurorubine combines in high doses three vitamins which are indispensable in the nervous system. Thiamin (Vitamin Bl) plays an important role as a co-enzyme in several metabolic pathways of carbohydrates alcohol and aminoacids. Neurons require chemical respiratory activities to produce energy and proper structure of neurons maintenance derived from the oxidation of carbohydrate mostly. This lmportant and essential role of thiamin in the breakdown of carbohydrate proved how its deficiency feads to a biochemical neuronal damage. In chronic or acute cases of deficiency of thiamin it is possible to observe neuropatic clinical syndrome, a wide range from Beriberi through Wernicke’s encephalopathy, Korsakoff’s disease up to alcoholic polyneuropathy. Pyridoxine (Vitamin B6) acts into the aminoacid. carbohydrate and fat metabolisms and it is also required for hemoglobin production. Pyridoxine deficiency due to inadequate dietary intake, absorption interference or drug interactions, leads to peripheral neuritis in adults and pyridoxine’s deficiency can affect the CNS development in children. and cerebral cortex. This causes a broad range of neurological signs and symptoms like paresthesia, diminished sensation of vibration and position, reluctant unsteadiness, depressed tendon reflexes, loss of memory, confusion moodiness and loss of central vision (retinopathy), delusions, hallucinations or even psychosis. There are different mechanisms of action for B-vitamins in the pain process. These B-vitamins are co-enzymes in several metabolic pathways in the nervous system They play an important role in inflammatory and edematous neuronal processes; impaired axons impulse transmission; abnormal high excitability of neurons in peripheral and central nervous system; synthesis of inhibitory neurotransmitters There are several clinical experiences and experimental evidences on the therapeutic use of the pharmaceutical combination of these three B-vitamins to revert neuralgi syndromes and the interference in the genesis of compressive, rheumatic and degenerative pains.
. Acute or chronic neuritis and polyneuritis.
. Neuromuscular pain, tremors, cramps.
. Coadjuvant in the treatment of migrain or peripheral vascular disorders.
. Asthenia. convalescence and major surgery procedures.
. Neurological consequences of multiple sclerosis and different types of anaemias. The dosage should be adapted to individual patients. Severe Cases: At the beginning of treatment and until the pain disappears. one ampoule every day or every second day by intramuscular injection. Subsequently, one ampoule once or twice a week. Standard treatment: One ampoule once or twice a week. The dosage should be adapted to each individual case: 1 -3 Lactab daily. The effect of levodopa is diminished by vi- tamin 86. 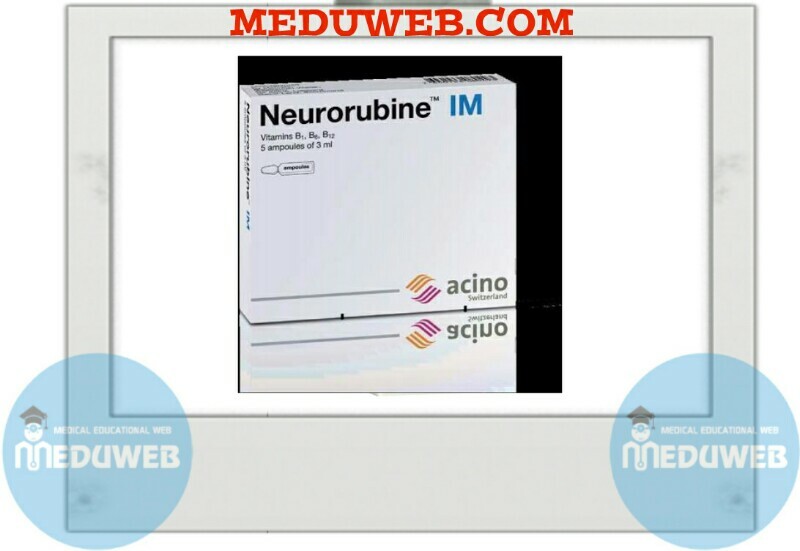 Neurorubine-Forte may be taken during pregnancy and lactation. Controlled studies in women have shown no risks to the foetus during the first trimester; there is no evidence suggesting a risk in the course of the remaining trimesters. portion of the gluteal muscle. If properly administered, the injection is painless.